H21 is most successful in categories needing extreme temperature capability and low wear rates. 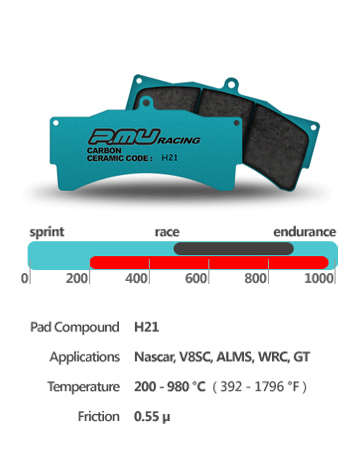 H21 has become the pad of choice is hard braking environments such as Nascar short oval and road course. H21 offers excellent wear properties and is very kind to the rotor. This pad is designed as ‘competition-only‘and is the pad to use for the very high end of almost all racing categories. With excellent pad and rotor wear characteristics this pad is also ideal for shorter endurance events such as 6 hour races.